Neale and Janet McQuistin believe a mix of traditional and modern livestock breeds are best suited to make the most of their marginal upland farm in south west Scotland. Neale McQuistin is the fourth generation of his family to farm in the Luce Valley near Newton Stewart and he and Janet have been tenants of the Stair Estates farm High Airyolland for 17 years along with the neighbouring Low Airyolland to total 365 hectares. Pedigree Beltex sheep were first introduced to the farm 10 years ago to add value to the sheep enterprise which until then had focused on Blackface sheep producing Scotch Mules when crossed with home-bred Bluefaced Leicester rams. And three years ago the traditional Highland breed of cattle were brought to High Airyolland with the aim of replacing the commercial suckler herd. “The cattle have fitted in with our long-term plan. I see it being quite difficult for marginal farms to be profitable as far as simply food production is concerned and we are going to have to rely on environmental payments for land management,” said Neale. 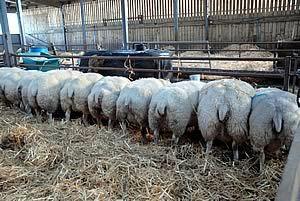 The Beltex also conversely plays its part in a de-coupled UK agriculture with its commercial abilities to produce lamb. “We’re moving towards a market-based economy where efficiency is going to become more and more important. Beltex are the most efficient sheep in converting feed into saleable meat because they have a superior bone to meat ratio. They are consuming less of your farm every time you sell a lamb,” said Neale. Ironically, both the Beltex and the Highland cattle came to High Airyolland after Neale had by chance spotted them elsewhere. He first saw the Beltex crossed with Scotch Mules he then supplied to a farmer in France and was impressed. This resulted in him buying about a dozen gimmers from breeders the French farmer knew in Belgium. And it was while fishing early in the morning on the Knoidart Peninsula near Mallaig in north west Scotland the sight of the Highland cattle which came down to the water to drink made him vow to start his own fold. The McQuistins are aiming for the pedigree market with their Beltex flock and testament was in 2004 at Carlisle when their shearling ram Airyolland Galahad topped the sale at 13,000gns and made a breed record for shearlings. That year they also topped the Lanark sale with a lamb at 1,500gns and had the highest Beltex price at Kelso with a shearling at 1,100gns. Later that year they had the top price at the Lanark in-lamb ewe sale with a gimmer which made 3,000gns. At the Carlisle August 2008 sale they set a new breed record for Beltex females with a gimmer called Airyolland Looby-Lie selling for 6,000gns. A shearling ram sold to 4800gns. The original flock was lost in the 2001 cull but the McQuistins had built up a number of contacts in Belgium and were able to source good foundation stock for the flock which included a ram that sired the top priced shearling ram as well as the 3,000gns gimmer. Airyolland Galahad was used as a ram on the flock and one of his lambs, Hunter, was sold for 5,000gns. Jumpstart, a son of Hunter was sold the following year at Carlisle for 3,200gns. “I’m convinced that by using a lot of your own breeding you can fix the qualities of your flock because you know the breeding on both sides. Because we have a reasonable number of sheep we can do this without the progeny becoming in-bred,” said Neale. Through some embryo transfers from the best ewes and the use of AI, flock numbers have built up to today’s 100 ewes. All the farm’s 600-plus ewes are synchronised and served by AI for management purposes – to capitalise on family help during the school holidays from Lauren, 15, Gavin, 13 and Caroline, 12, as well as Janet who is a part time teacher. The Beltex and 30 Bluefaced ewes lamb over a few days in mid-February to coincide with a weekend when Janet will be off work. The AI work is carried out by UK breeding services company Innovis. All the Blackface ewes are crossed with the Bluefaced Leicester and they lamb during a five to six day period in the first week in April when this year’s school Easter holiday falls. In the last 10 years the McQuistins have rarely been out of the top 10 prices at Castle Douglas where they also buy their Blackface replacement females. This year’s lamb crop is all by 12 home-bred ram lambs which will provide a good barometer for the crossing abilities of the Bluefaced Leicester flock. The immediate past chairman of the Bluefaced Leicester Sheep Breeders Association, Neale McQuistin has been breeding Leicesters for 30 years and they were his first venture into pedigree sheep breeding. The current sheep are mostly bred from the original flock, thanks to one ewe which happened to be being flushed at Edinburgh in 2001 with only a handful of females being bought in. While numbers have been built up over the last six years there have been few Leicesters to sell although this year a crop of shearlings will be presented for sale at Kelso. With the flock now at an optimum number it is unlikely that they will be flushed on a regular basis however, the Beltex will continue to be to further improve the flock and possibly increase numbers. The couple also have 15 Dutch Texels. 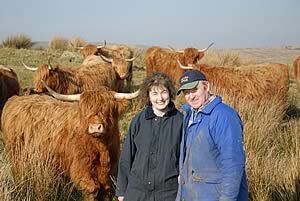 The hardy Highland cattle are well suited to the wet, black land which runs up to 120 metres at High Airyolland. From three foundation females bought in Oban three years ago, the fold now numbers 12 cows plus youngstock and a stock bull. The herd calves in February and March. The farm’s original herd of 50 bought-in Aberdeen Angus cross Friesian sucklers were sold this summer. “I can’t see us making a good enough return on capital investment with suckler cows. The Highland cattle will be self-generating. While they may not make as much money they are very easy to keep and have low requirements throughout the winter when they are kept outside,” said Neale. “Eventually, the herd will get up to 50 or 60 cows and at that point we will probably cross the lower end of the herd with a Dairy Shorthorn to produce a superior suckler cow, selling the calves as heifers and finishing the bull calves which we would aim for a niche market. “They have a very placid temperament and they are low input, low output. They graze the hill in winter and are fed no silage or hay, just supplemented with a 16 per cent protein concentrate, said Neale.